The base and registration point for the event will be the Shawbost Old School Community Centre just across the road from the new Shawbost School. This will also be the transition point from bike to run and the Finish for the event. 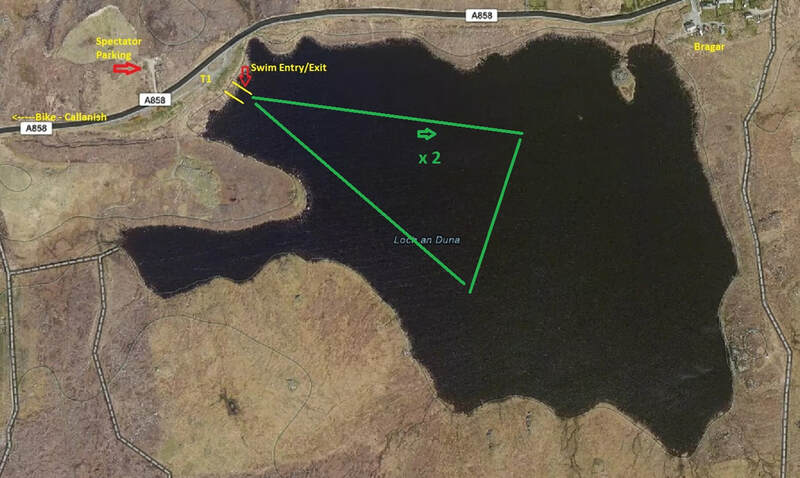 The 1.5km swim section starts and finishes from the west side of Loch an Duna in Bragar on the A858 main road 2K from the Community Centre. It consists of 2 x 750m laps of a triangle course which will be marked by 1.5m high marker buoys. 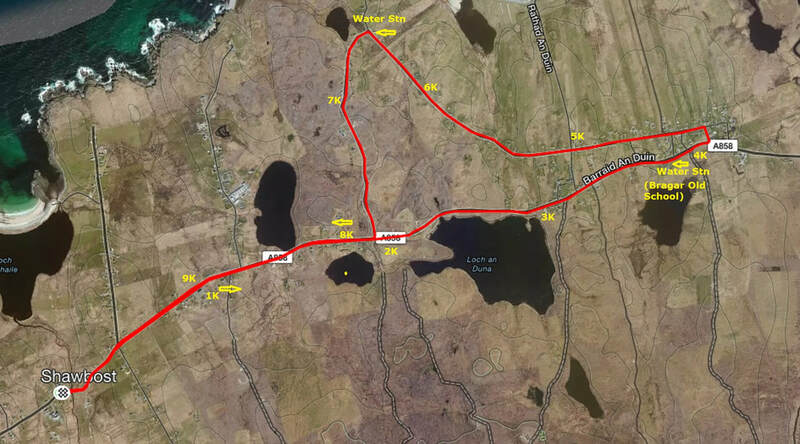 The 41K bike stage is on an out and back course which takes a left from the swim/bike transition area at Loch an Duna and follows the main A858 road for 22K, before turning right at the junction leading to the Callanish Stones visitor centre. Just before the visitors centre the course takes a right up a short sharp hill skirting the Stones and follows the village road down to the right and back onto the A858. From there its a left turn and a 19K retrace on the main road back down to the Shawbost Community Centre for the transition onto the run section. Leaving the Centre the 10K run heads east on the A858 road towards Barvas for the first 4K before taking a left onto the North Bragar village road. 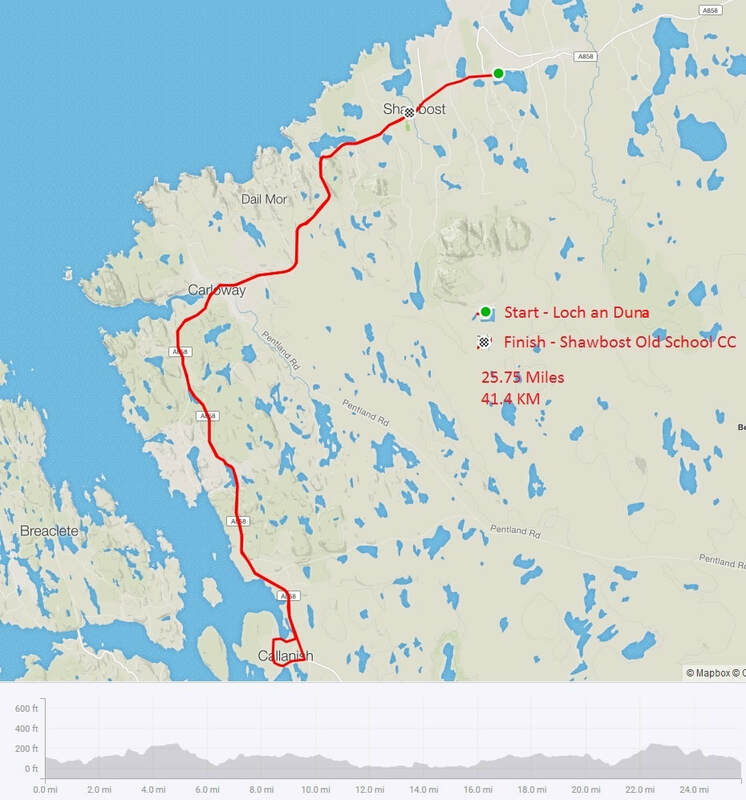 It continues on the inner village roads through North and South Bragar before turning left just before 7K to rejoin the main A858 road and a right turn at 8K for the final stretch back to the finish at the Shawbost community Centre.. The Hebrides Triathlon organisers are grateful to the Horshader Community Development Trust for their financial support in running the inaugural 2016 event and for also awarding funds in 2017 to facilitate the purchase of custom bike racks and other event equipment. The Hebrides Triathlon organisers are grateful to BASF Pharma Callanish for donating funds to enable us to create safe access to the new 2018 swim venue at Loch an Duna, and for the purchase of additional safety equipment.